What are 360° cameras for? Although cameras with dual lenses capable of filming everything around them have been around for a few years, they've so far been viewed largely as novelty products. However, as the virtual reality (VR) era kicks in, a number of organisations are beginning to use 360° cameras more seriously. The hospitality and travel industries have been quick to embrace the new format to showcase stunning locations. News organisations such as the BBC, Sky News and the New York Times are all experimenting with 360° video, while both YouTube and Facebook now support uploads of 360° content. It’s still early days, but here are some tips on how to make compelling 360° photos and videos. Don't think of a 360° camera as a new way of producing panoramic photos; it's no good simply replicating the shots you take on your existing camera. Sure, you'll have a much wider field of view, but the nature of most 360° cameras is that they use two fisheye lenses, and have software to auto-stitch together the two images. Fisheye lenses are ultra wide-angle, so they optically push away subjects in the distance. So instead of trying to capture a wide-open vista, go to a location where there are subjects in the foreground, be they buildings or people. That’s essential for the ‘little planet’ mode often used for 360° photos, but also for the inverted version where the sky is a sphere in the image’s centre. Whatever mode you use, you need to shoot somewhere that's interesting, thereby tempting the viewer to look around in all directions to make the most of the experience. 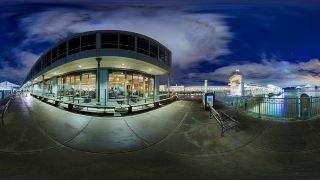 For arresting 360° video, it could be a bustling market square where a lot of people are moving around close to the camera, or two people chatting in a beautiful location, or an intimate ceremony in a temple. For video, completely raw, unedited experiences are possible, but so are scripted, carefully designed sequences. One of the best aspects of shooting in 360° is that you don't have to point a camera at anyone; for many scenes you can just set and forget. However, there are two choices about the placement of a 360° camera, and it largely depends on what product you purchase. Some 360° cameras are sold as standalone cameras that can be placed either on the floor or on a tripod, and controlled from afar via a smartphone app. For these types of 360°camera, it's possible to place them somewhere and leave the scene. Others are designed to attach to a smartphone, which instantly means that they're going to be used for 360° selfies or, at least, pieces to camera. Although there is a lot of crossover between each type of 360° camera, the former is for capturing interesting scenes, and the latter is generally for people who want to be the star of their own 360° video. 360° cameras are all about creating a point of view that the viewer likely hasn't experienced before. For example, you could attach a 360° camera to the side of a hot air balloon, which will allow the watcher to experience what it's like to be both looking out of the balloon and also looking back at the people in the basket. Generally you need to put a 360° camera at head height if you want the viewer to feel like they are physically in the place you're filming. However, just as compelling can be a point of view that's completely different, such as on the floor to mimic the point of view of a child, or even an animal. Although this doesn't make a huge difference if they're watching a 360° video or photo on social media, the point of view that you choose will be amplified if the viewer is using a VR headset. Also bear in mind that 360° photos and video can’t easily be edited afterwards (save for cropping the beginning and end points) since the camera picks up everything in all directions, so make sure there's no clutter in the shot, such as bags – or even yourself. Whatever you decide to do with a 360° video, remember that you are the director and that you have control over what is in the video – and a lot of influence over what the viewer should be looking at. That power is at its most potent when your film begins because even a 360° camera has a default starting position. Get to know that position, and make sure the video opens with the most interesting thing in your environment. Jumpy and fast-moving videos from 360º cameras can be very difficult to watch, so every single movement of a 360° camera should be for a reason. So, don't be tempted to move the camera quickly between subjects. Producing 360° content is about lingering on subjects and allowing the viewer to explore the scene themselves. Sure, you can guide them by slowly moving the camera into a new scene, but it's usually more helpful to cut to that scene without much, or any, camera movement. A selfie stick can be really useful because it enables you to place the 360° camera in front of you for doing a piece to camera or an interview. However, it also lets you change the point of view very easily, lifting a 360° camera high above a busy crowd, for instance. If you do intend to be the star of your own 360° video, think about how you want the viewer to react. For instance, if one person speaks to the camera, the viewer will only have to look in one direction, which kills the point of the 360° video in the first place. So if you intend to have someone having a conversation with another person in your video, have them stand far apart so the viewer will have to turn their head to see who is talking. Is momentum building behind the 360° format? For now, it may be only pioneering photographers and videographers who are experimenting with 360° photo and video creation, but the ability to capture and share a real experience in its entirety is surely destined to become a significant storytelling skill in the coming years.